Humanity has always thrived to explore the unknown, and particularly the cosmic universe that lies beyond the stars. Across all entertainment mediums, space and sci-fi has always enjoyed a relative degree of success. But it is only in recent years that games have begun to truly expand on this interstellar setting, pushing the boundaries on the sort of creative and large virtual worlds that we can explore with the aid of technical advancements. One such game was met with a lot of early promise when it was revealed over two years ago. No Man’s Sky, a space exploration game from Hello Games, delivers on a few of the gaming milestones that we’ve waited years to achieve. But overall, it presents a rather repetitive and shallow trek through the vast nothingness. You begin on a random planet, with your ship in dire need of repairs before you can take off. No Man’s Sky takes a very sandbox approach with its gameplay. The players will receive a myriad of text tips along the way, but for the most part you’re free to do as you please. Besides your ship, the other two gameplay elements to worry about are your suit – which protects from the often harsh environment conditions, and keeps you alive via life support – and your multi-tool. The multi-tool is your dual purpose mining apparatus and, when necessary, weapon. As you take the first steps in this vast world, you’ll mine/zap various natural elements that occur all around you, from Iron and Carbon to Plutonium and Aluminum. The more common elements are what’s needed to get your ship operational and depart from your starting planet. As you venture out into the atmosphere and then into space for the first time, it’s awe-inspiring. Simply seeing the vastness of the planetary system that you’re in is both daunting and motivating. 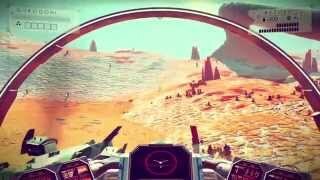 The entire universe in No Man’s Sky is randomly generated – this means that there are literally millions of planets to explore, each unlike the last. From a technical perspective, it is an immaculate achievement. If you’re the sort of player that loves the exploration aspects of other open world games, this is a universe you could lose a lifetime in. The fact is, No Man’s Sky is truly the first game that can realistically say – if you can see it, you can go there. Did you observe a distant moon covered in purple mist? You can fly there and explore it. Did you notice a planet consisting mostly of water? Land on it, and dive in. It’s incredible stuff from the exploration perspective. Apart from possessing a randomly generated landscape, color scheme, alien flora and fauna, planets also have plenty of points of interest. These can include abandoned buildings, factories, trade outposts, and ancient obelisks. Exploration feels enticing in No Man’s Sky, thanks to your trusty jetpack that helps with the terrain navigation, and because most points of interest feel close enough nearby to keep you moving. You’re never too far from the next location, and the game UI helpfully tells you how long it will take to get there. The planets, as is the universe around you, are exponentially huge and would take many, many hours of walking to cover. While on these planets, besides visiting outposts, you’ll be mining for resources. With the multi-tool, pointing your laser beam and breaking down materials is straightforward as it would be in any similar game such as Minecraft. Finding a rare element is exciting and simple thanks to your pulse scan ability, as is discovering caves or underwater structures. Credit should be given to the game’s random generation because some of the areas you’ll explore will look quite beautiful in their geometry, as if they were created by mindful developers by hand. Exploring your first few planets is stirring and interesting, as you try to build up your reserves while discovering crazy looking creatures, plants, and trying to survive the sometimes life-draining environmental conditions. The space gameplay is similarly engaging at first. The ability to fly between planets in a system and landing almost anywhere you’d like is freeing, and gives players tons to explore to the point of it feeling a bit overwhelming at first. Each system usually contains 3-5 vastly different planets and a space station. Players can use their pulse scan while in orbit to identify a few points of interest before heading down to the surface. The space station, meanwhile, offers the chance to meet alien species (though you can meet them on planet surfaces as well), and a trade terminal. 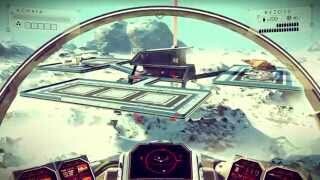 Herein lies another core gameplay element of No Man’s Sky – trading and crafting. Across their travels, players will find a variety of blueprints that are used to craft upgrades. From better enviro-suit resistances, to improved mining ability, to improving your ship’s weaponry, there are plenty of upgrades to craft using the materials you’ve mined. These RPG-like elements are what drive the game’s economy, as you also need to craft certain items that will allow you to perform intergalactic warps between the star systems. You can buy and sell various elements at the trade terminals, and some will offer better prices than others depending on their rarity in the local system. It’s a straightforward economy and it works. Other gameplay elements include random events as well as learning languages. The game has a few different alien species, and your standing with them affects your interaction options. You’ll learn new words by discovering ancient Monoliths or simply asking them to teach you a new word. Many conversations will be completely cryptic to you, as they are not in English, but as you learn more and more words, they will become translated during your interaction with the galactic species, and it will become more obvious what the conversation is about. Understanding the problem and picking the right answer is often used as a mini-puzzle that yields a reward. It’s a rather cool mechanic and works well. As for the random events – you could stumble into a storm on a planet that accelerates the deterioration of your suit, or warp into the middle of a space battle, or even get attacked by space pirates. Unfortunately the space events aren’t very enjoyable because of the game’s rather awkward spaceship controls that feel loose and not very responsive. And unlike in most popular sci-fi, you can’t simply warp away to safety. On the ground, your combat engagements will be against robotic sentinels that patrol the planet and don’t take kindly if you mine too much or kill the wildlife in their presence. So you’ll occasionally die, but it’s not a huge deal – you will respawn, and then be able to travel back to your grave and collect everything you dropped. But what is it all for? The main objective in No Man’s Sky is to reach the center of the universe, and a helpful path always points the way, should you choose to peruse this goal. There is also another path, following a mysterious Atlas being, which is the main source of the game’s minimal narrative. Despite being infrequent, the writing in the game is on a fairly high level, and its brief excerpts read like they could easily belong in a sci-fi book. Having said all that, it’s best to play No Man’s Sky at your own pace, and not strive to reach the ending of either story path. The end result is not worth the effort. It begs comparison to the similarly incredible open world with disappointing gameplay in 2014's The Crew. And so eventually, the game’s immersion and thrill begins to break down. Piece by piece, planet by planet, you’ll come to realize that all of the gameplay mechanics that seemed so impressive and addicting mere hours ago begin to feel shallow and repetitive. The randomly generated worlds will start to feel similar and generic. There are rather few terrain combinations, and each is simply painted with a different color scheme. The flora and fauna will begin to look like a series of parts mashed together that could serve no realistic function, like a collection of fan-made creatures from Spore. Even the cave systems will begin to repeat themselves in style and natural resource content. The exteriors and interiors of buildings and space stations are also very similar to one another. Heck, you’ll even run across identical above-mentioned conversation puzzles that ask the same question and have the same solution. While the randomization is strong, there are clearly more elements needed to help the game feel more diverse as it takes just a few hours to begin seeing the gaps in the illusion. The randomness of it all can also affect your early experience – I had the unfortunate roll of spawning on a planet completely devoid of Zinc, an element needed to fix your crashed ship at the start of the game. After wandering through a mostly lifeless landscape for over two hours, I was ready to give up and start from scratch, until by chance I came across a trading terminal and purchased some zinc. Other players may find themselves in similar disarray, or perhaps spawning on a planet with extreme conditions for which they cannot be possibly prepared. Players can also scan alien life and rename/upload them into the global database; but aside from a small cash payout and a tiny chance that someone will one day come across your named planet or creature, it feels like a pointless endeavor. Nor do you feel like an explorer documenting a brave new world, simply because it’s a potentially endless task as you’re barely making a dent in the insanely large number of planets and creatures that can be identified. All those resources you collect will be stored in your highly limited inventory. One of the most annoying aspects of the game is just how little you can carry. All items that aren’t elements do not stack, and the stacks differ in sizes between your suit and your ship, further adding to the endless glut and excess micromanagement. Your suit, ship and multi-tool all require elements to operate, but don’t automatically refill even if you have it in your inventory, further adding to mundane repetitiveness. The downside of randomization also comes into play here - the only way to improve your storage capacity is by finding points of interest on planets which may or may not contain a purchasable upgrade for your suit or a higher capacity multi-tool. Getting a ship with more storage is equally left to chance, as you can buy them only from random aliens that come and go at space stations and ports. With frustratingly limited inventory and no guaranteed method to improve it, the impeccable exploration freedom of the game world is dragged down. And yes, each of the upgrades you can craft from blueprints for your suit / ship / multi-tool take up an invaluable inventory slot. But the game is so relatively easy from a survival/combat perspective, that it doesn’t really feel worth the effort to find and craft these minimal upgrades to your abilities. So you can jetpack a bit further, or mine a bit faster, but it’s often not worth the inventory slot it takes up that could instead be filled with valuable minerals or items. Because of procedurally generated worlds, players shouldn’t expect to see too many breathtaking sights, lest the cards fall in your favor. While there are some great lighting effects and color variety, most of the game looks rather low resolution. Textures are bland and copied across the world, draw distance is poor and objects spawn in right before your eyes – sometimes resources you’ve mined will re-appear once you move further away. The materials didn’t respawn though, as you approach and realize the game simply doesn’t render the impact you made on the terrain from afar. The game does manage to maintain a steady framerate, at least. Audio is similarly uneven – while some of the individual tracks are great, they sometimes clash, or play at inappropriate times. The game’s technical missteps are equally troubling. This is one of the most unstable games on the PS4, with multiple crashes during every play session. Your progress is thankfully saved each time you step out of your ship. Other problems include a seeming lack of connectivity to the game’s servers from launch to this day, so it is unclear if your discoveries get uploaded, or if you ever have a chance to run into other players’ named planets and creatures. There are occasions where the game takes your screen hostage to tell you about a newly achieved personal milestone, or greeting a new alien, and during these moments you lose all ability to interact with the world – which can range from annoying to deadly if you’re engaged in combat. Despite what should be a crowning achievement for the space genre in video gaming, No Man’s Sky doesn’t quite satisfy. Its sheer scope and sense of wonder are amazing at first, but the immersion is fleeting. The core gameplay loop of exploring, resource gathering, then selling your items and jumping to the next solar system grows tiring quickly. You can’t create anything nor is it challenging as a survival game, so the only thing left is to beef up your bank account, craft some minute upgrades and try to make it to the galactic center (which isn’t worth the journey). The technical issues and full asking price don’t help, either. If all you want is to enjoy a stream of randomly generated locations and life forms while gathering materials, you can get lost in the No Man’s Sky universe for a very long time. Most players, however, will find that despite the impressiveness of this vast game world, the gameplay just isn’t enough to keep you engaged for long. Despite a varied color palette and some good individual music tracks, the game struggles with poor textures and overall a low image quality. The procedurally generated galaxy gives an incredible, but fleeting, feeling of boundless possibilities. Once you start to actually play however, the multitude of design issues and lack of variety let disappointment and boredom set in. You could be playing No Man's Sky for an eternity and still not technically see everything that it has to offer. If you have any desire to make progress or maybe see what's at the end of the quest lines, though, you'll find a long and uneventful slog (albeit well written) that leads to a non-existent conclusion. While the framerate remains steady, poor draw distance and constant crashes negatively impact the overall impression. 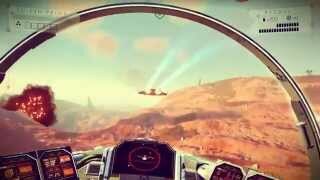 No Man's Sky is a better technical demo than it is a full priced game. A randomly generated universe sounds like an impressive concept, but the underlying variety and most of the gameplay design could have used more depth. No Man's Sky is ranked #1202 out of 1434 total reviewed games. It is ranked #111 out of 138 games reviewed in 2016.